A few years ago I discovered with a fair amount of surprise that for years I had been pronouncing the name of my favourite tea brand wrongly. 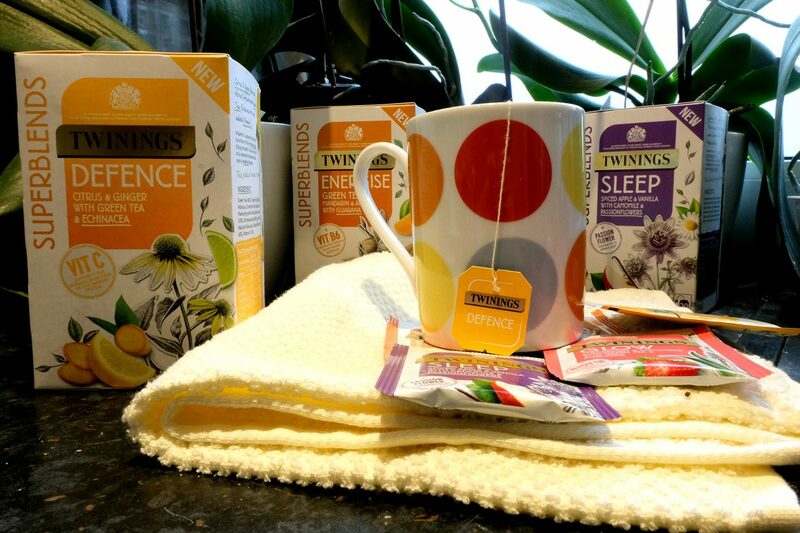 Indeed, insteading ‘tuinings’, Twinings is pronounced ‘tuainings’. The fact I had been so wrong about it did not deter me from continuing to be a fan of their products, particularly the classic Earl Grey and their patent, beautiful Lady Gray which I am gutted they now provide mostly in tea bag form as oppose to loose leaf (which I much prefer). They also of course have a selection of herbal teas, of which I am also a regular user… I drank plenty of fennel and camomile teas right after having little O; I am partial to their special editions, and usually buy those tins when I fly somewhere (as easier to buy at the airport), the latest in my collection being for the Queen’s 90th birthday. 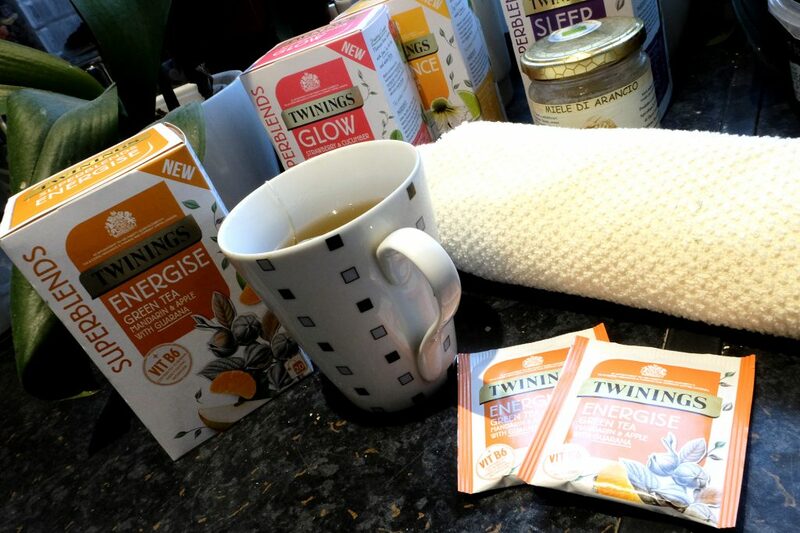 Twinings recently launched a selection of new herbal blends, in a new, colourful and uplifting graphic dress too, and I was sent a box to try them out by their lovely PRs. 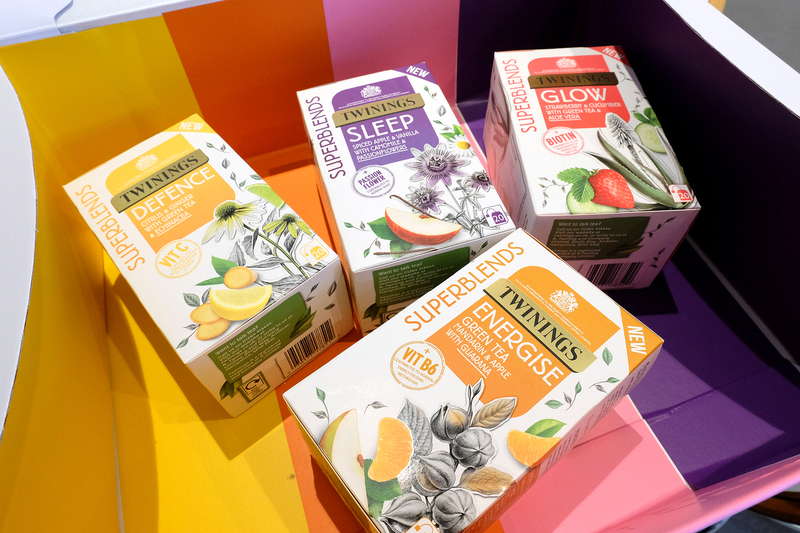 Carefully crafted by the Twinings Master Blenders, SUPERBLENDS are a simple everyday helping hand to support one’s wellbeing and keep us feeling great. The four blends I tried were all quite interesting, and I liked a couple quite a lot. What did I try? Energise: Mandarin & Apple Flavoured Green Tea with Guarana and added Vitamin B6. Feeling full of energy is the inspiration behind this carefully crafted Energise blend. This blend contains Green tea and Guarana, with Mandarin and Apple flavours which bring sweetness. They also added Vitamin B6 which contributes to normal energy-yielding metabolism. This green tea has subtle citrusy flavours from the mandarin. It’s clean and fresh tasting. Sleep: Spiced Apple and Vanilla Flavoured Herbal Infusion with Camomile and Passionflower. 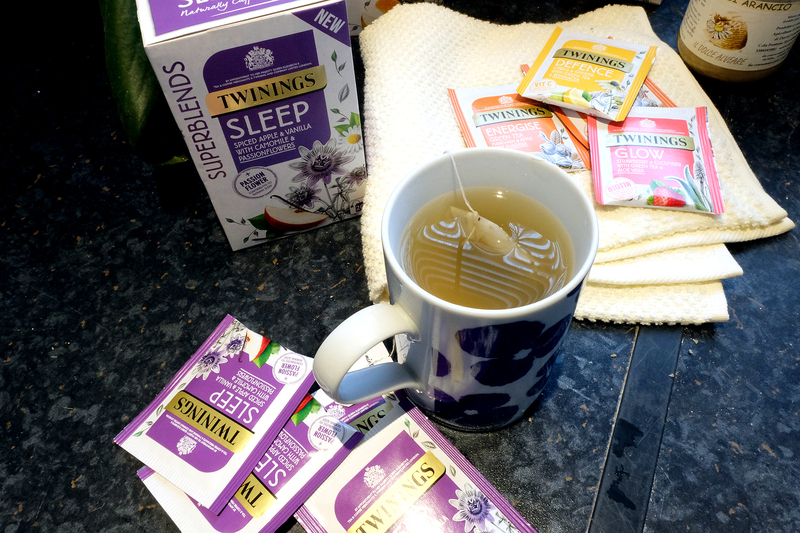 Getting a full night’s sleep is the inspiration behind this carefully crafted sleep blend (and gosh knows I could do with one at the moment!). This blend combines camomile, passionflowers, apple and vanilla flavourings and is smooth and warming. Passionflowers are beautiful, exotic looking plants with bright purple flowers and traditionally to support normal sleep patterns. Defence: Citrus & Ginger Flavoured Herbal Infusion with Green Tea, Echinacea Root and added Vitamin C. Vitamin C supports the normal function of the immune system; a combination of green tea, juicy fruit flavours and Echinacea root provides a comforting taste, while the added Vitamin C helps to support your immune system and helps you feel at your best every day. The addition of a little ginger into the mix helps to make this blend warm and smooth. I like that echinacea is added: it is a tall plant with bright flowers and a spiky middle and is meant to help fight cold and flu. 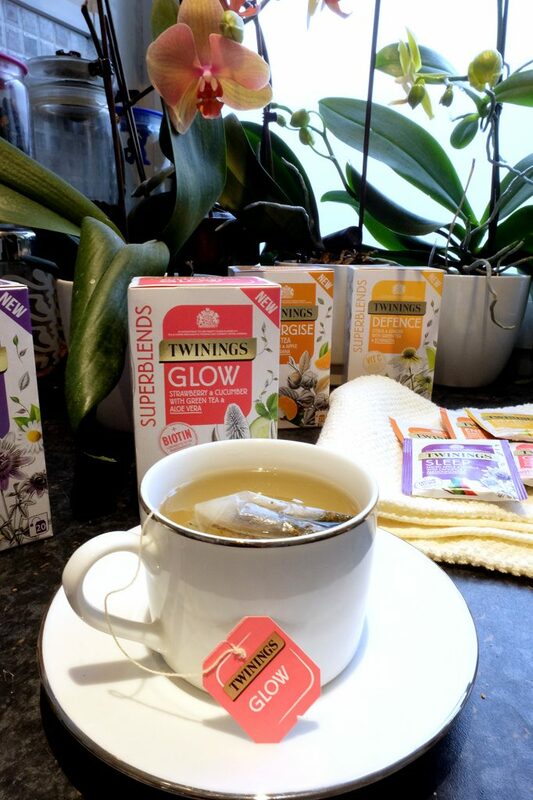 Glow: Strawberry and Cucumber Flavoured Herbal Infusion with Green Tea, Aloe Vera and added Biotin. Biotin contributes to the maintenance of normal skin and normal hair. This blend is a delicious mix of refreshing Green tea, Aloe Vera and Cucumber flavouring. The strawberry flavouring is quite powerful, and this is actually the least favourite of the blends, as I find it a little bit too fruity. There are other blends in the range (including matcha and turmeric tea); the packaging looks beautiful, modern and attractive (I could not bring myself to throw away the boxes and they are now on display on my shelf). What I found interesting, as a side note, is that Twingings launched a similar range last year in Australia, minus the vitamin boosts. Their look and feel is similar yet the mix of herbals quite different, even if the names are the same (eg Sleep). I was lucky as a close friend visited me and brought me a selection of them, and I had already been able to appreciate the brand’s new offering. I received the box of #superblends as a gift but was not asked to write a review; opinions are my own. 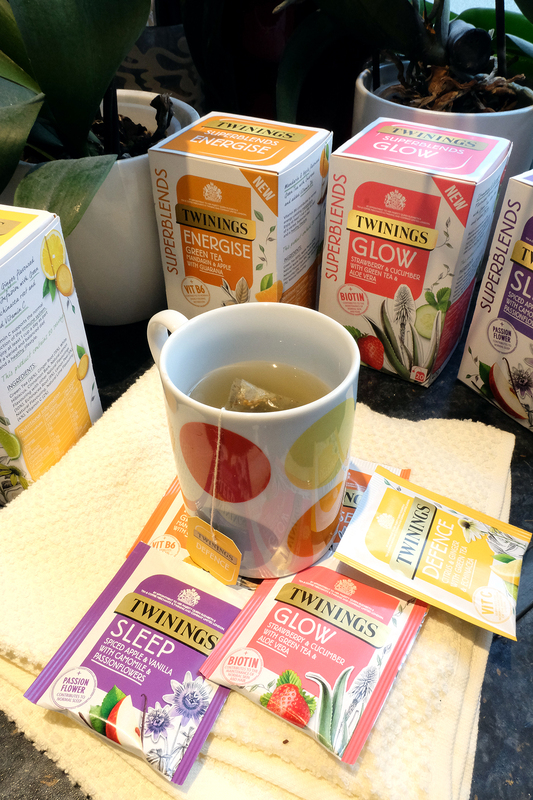 I’m a big fan of Twinings, and do often buy it, especially flavoured teas, including my fave Earl Grey. Haven’t tried their new range yet, though I’ve seen it in the shops. Sleep sounds particularly enticing. And I love the one with Echinacea… feeling under the weather so having a cup every evening now!